It is official! I have been licensed by the City of Buffalo. 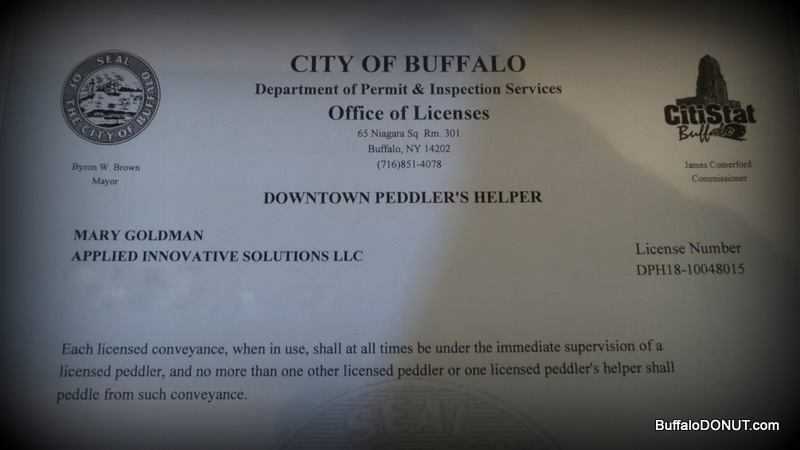 I am now a Licensed Downtown Peddler's Helper. That is the greatest! It is much cooler than being a Peddler, say I. 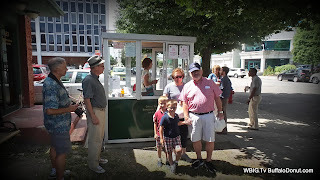 My great-great-great grandfather, Meinrad Kunz, he was a peddler. I know because I found him once in the City Directory in the 1850s. But I am a Peddler's Helper. Above is a picture of me helping at the City of Buffalo Department of Coffee and Donuts, our donut booth downtown. It is just a once-a-week thing so it is not as if it takes up all my time. The time it does take, I make that count. You can tell by looking at the picture that I am peddling as fast as I can! Because I can just tell that there are people who think I am making this up. Now here is a funny donut story. Last time I checked in, it was Leonard Pennario's birthday. I had in mind that it would be a great day to resume this Web log, which had kind of hit the skids on account of my breakneck-pace work schedule. I was going to write about how the Pennario project was coming along, what a high priority it is for me right now, and celebrate his birthday that way. Instead I celebrated his birthday with donuts, doh. Oh well. Who knows, the donuts might help pay the bills while I am finishing the book. Besides, Pennario liked his sweet treats.